A very special THANK YOU to everyone who has supported Jeff Heotzler Racing over the years. Without your generosity, we wouldn’t be able to do what we love and compete at the highest level possible. Keizer Wheels – The “Keizer” of the custom racing wheel industry. Arts Radiator – Innovation in cooling system parts. ATL Fuel Cells – The world leader in safety and performance fuel cells and liquid containment. Behrent’s Performance Warehouse – Your one stop shopping site that features all the top name brand high performance racing parts, racing equipment, racing engine parts and safety equipment. Bert Transmission – Builders of the finest transmissions and components since 1985. Beyea Custom Headers – Offers Performance Headers, Merge Collectors and Tri Y Headers custom built to fit your need. The Brake Man – Is an innovative designer and manufacturer of made-in-America brake systems and components for motorsport, street, and fleet vehicles. Comp Cams – The absolute leader in valve train technology. 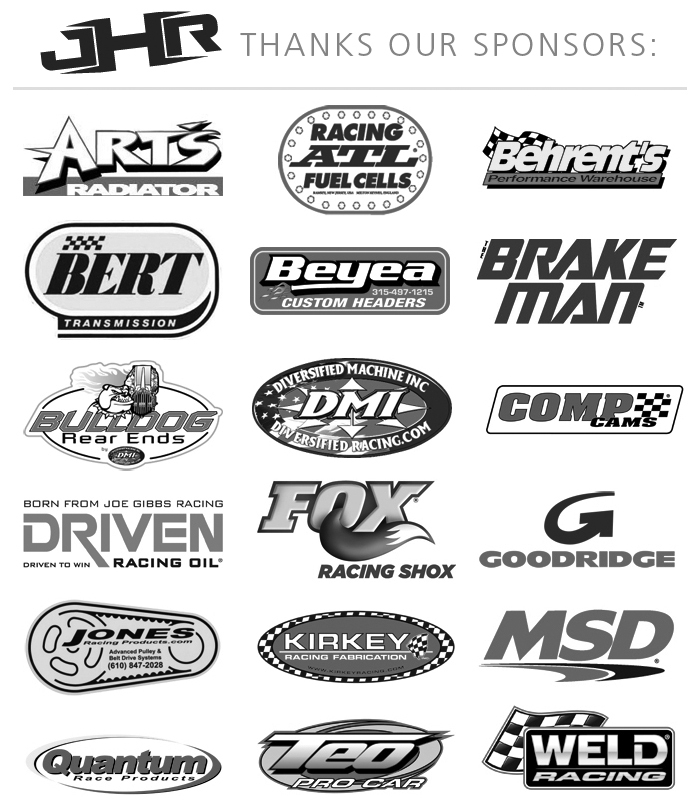 Bulldog Rear Ends/Diversified Machine Inc. – Innovators of the short track racing industry. Driven Racing Oil – Makes high zinc racing oils, gear oils, break-in oils, hot rod oils, brake cleaner and foaming degreasers. Goodridge Fluid Transfer Systems – Is the world’s leading manufacturer of performance fluid transfer systems. Fox Racing Shox – 40 years of redefining ride dynamics. Jones Racing Products – We have the right drive kit for you! Save horsepower, reduce harmonics, and experience our unparalleled lightweight design and longevity. Kirkey Racing Fabrication – Is one of the largest seat manufacturers world wide. MSD Ignition – The most recognized name in performance ignition systems. Quantum Race Products – Affordable scales, gauge panels and switches built for the rough conditions of racing. Teo Pro Car – The innovators, not duplicators, of the Northeast dirt modified chassis and chassis components.